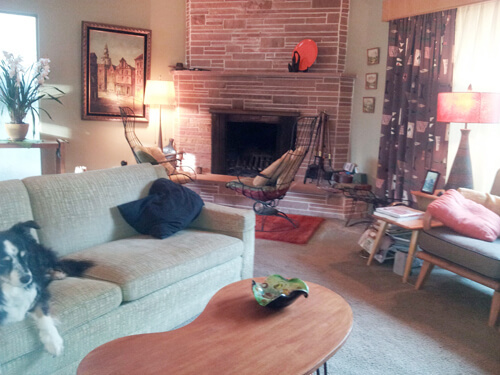 Home » Other Rooms » readers and their living rooms » What color to paint the accent wall in Karen’s living room? 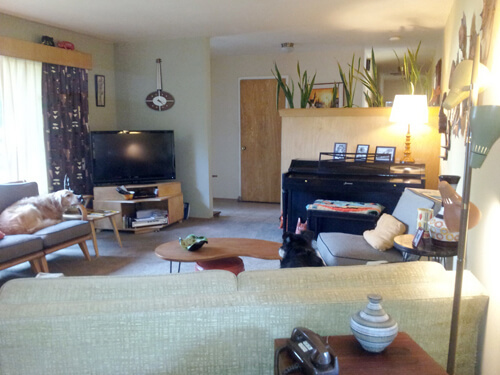 What color to paint the accent wall in Karen’s living room? When Karen asked our opinion on whether to replace her original ceramic tile kitchen countertops (160 reader comments so far! 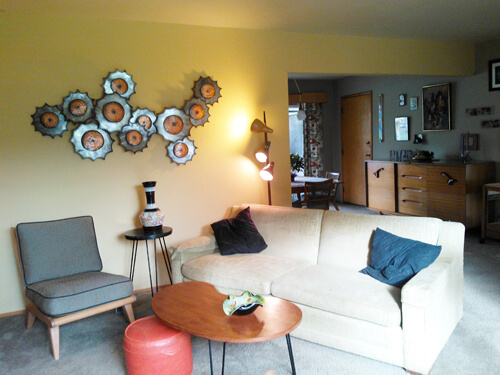 ), she also asked for help in finding a great color for an accent wall in her retro living room. To help accent her metal wall sculptures and add some pizzazz to her room, Karen wants to paint the long wall — which stretches from her entry way all the way to her fireplace — a different color than the other, light green-painted walls. 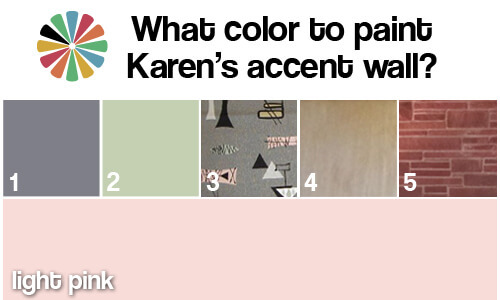 I love color puzzles like this, so of course I told Pam I’d take on the task of suggesting an accent wall color for Karen. Hi Kate, How thoughtful of both you and Pam to take the time to help with my room. I’ve painted that wall, the main one that runs the length of the house, opposite the window, at least four times while the rest of the walls remain — they are a subtle earthy green that looks appealing next to the fireplace. For the accent wall, I’ve tried brick red, tan, and most recently the yellow shown in the top photo. The focal point is the metal art sculpture, a very authentic piece from the early 70s made by a guy in Canada, brought home in a VW bus. I love the sofa, too, but the green is hard to match, and it’s getting pretty clawed up, so I’m not going to try to highlight it; I really need to recover it. The Heywood Wakefield Aristocraft chairs have covered cushions in a gray/black retro pattern. Recently, I brought home a sample of gray/purple and smeared it on the wall, ugh! So, with your fresh viewpoint, where should I go with this? Thanks so much, truly. When Pam was handing off Karen’s info to me, she pointed out that Karen’s bark cloth curtains were likely a recently available pattern called Mambo. Armed with this information, I started by pulling together swatches of color, pattern and texture from the room. I took the major repeating colors and textures and made a mini swatch board, so that I could see all of them together. This is always a good place to start if you aren’t sure what direction to go with a room. In this case, looking at Karen’s choice of fabric for the curtains — which would be much more expensive to change than a wall color or accessories — is a classic way to help dictate the color scheme of the room. Any time you add an element like patterned or multi-colored curtains, upholstery or rugs into a room, it is important to repeat those colors throughout the room — this helps make the room make good design sense… These large, costly “foundational” elements “pull” a room and all its colors together — all your colors are in those patterned pieces, repeat them! 1. 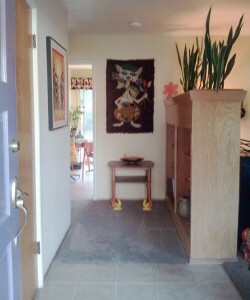 The grey color from Karen’s entry way tile, upholstery on chairs and one of her sofas, and the main color of the bark cloth curtains. 2. A light green, this is what the other walls are painted and the sofa (even if it needs to be recovered) is currently this green. 3. The bark cloth curtain fabric — mostly grey but with hints of pink, white, black, yellow and green. 4. The blonde/light colored wood that repeats throughout the room. 5. The warm brown of the stone on the fireplace. Karen said she had already tried a brick red, tan, yellow and a little dab of purple grey, which earned an instant yuck. So, what’s a girl to try next? Here’s what I think: Karen has a lot of grey and colors with hints of grey in them (the green on her couch and other walls is a shade of green, which means a tiny bit of black has been added to tone down the color.) 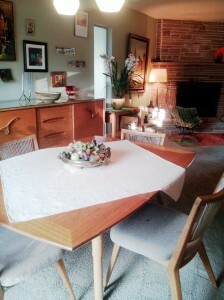 The other main colors are neutral — the warm browns in the fireplace and the wood tones in the furniture. I think Karen didn’t like the brick red because it was too close to the fireplace color, which blended instead of allowing the fireplace to stand out. The tan likely was too close to the wood and therefore made the room feel too tan overall. The yellow was a good idea, but because it is so light, it too is too close to the wood tones — thus the same “too tan” affect. Her dab of purple grey probably pushed the room into grey overload — therefore earning the yuck. My solution? Pump up the color! Why did I choose a medium coral color? First it is vibrant — no grey in sight — which will create instant pizzazz. The pinky coral complements the light wood tones nicely and provides a nice backdrop for the sculpture wall. Coral is a complementary color to the green already found in the room through the couch and other walls (mini art lesson — red and green are opposite on the color wheel — which makes them complementary colors) and complementary colors play nice together. The coral also works well with all the grey in the room — warmly popping forward while the cool grey recedes, creating balance. From what I can tell from the picture, the coral should also coordinate nicely with the fireplace stone. Yes, both are warmer colors, but they are different enough in value (fireplace is dark, coral is mid, most of the rest of the room is light) that they shouldn’t compete for attention. A light pink accent wall would also work in your space for many of the same reasons that the coral works. It still coordinates well with the grey, green and wood that fills your living and dining room area and would also still works very well with your fireplace and curtains — it is just the toned down version. Do we spy a pink shade on your pole lamp — that might be your light pink! If it were me, I would go with the coral, but I know not everyone likes a bright accent wall. Another bit of advice — I noticed you have quite a few bright orange accent pieces in your room — your footstool, rug and decorative plate in front of the fireplace, etc. What I might do is to move all the orange accents to another room and then go “shopping” in your house for other accents — like art work, pillows, pottery, knickknacks — that have pink in them. Adding more pink to your living room will help make the room look more cohesive and finished and will help cement your expensive draperies into the design of the room. Ultimately, one of two orange accents can be brought back in, but again: Your draperies are suggesting that your principal accent color should be pink, not orange. I hope I’ve helped you pick a new accent wall color for your room, or at the very least, given your brain a fresh thought process to follow in your quest for the perfect accent wall color. Best of luck — let us know what you decide! 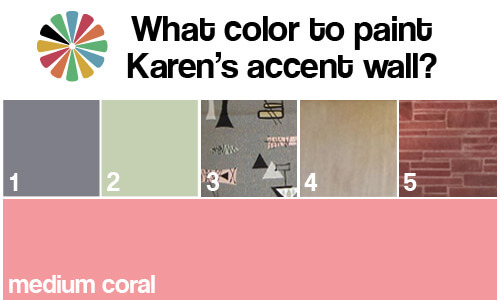 Is medium coral a good color for Karen’s accent wall? Is the light pink a better option? What color would you advise Karen to choose? See Kate’s story — Accent wall: Four steps to get them right — here. I know this is not answering the question, but what about just all the walls painted white and let the beautiful furniture pieces shine? It would almost be a museum look. A pale turquoise accent wall with the rest of the walls white might be nice with pink and pale yellow accessories. To me, the furniture layout seems awkward. It seems like the fireplace or the large window should be the focal point of the room. I have no idea what you do with the pesky tv when you lack wall space. I dislike tv’s above fireplaces, but in this room, that might be the best option?? I too think the furniture placement is awkward. I suspect it’s because the fireplace is stuck over in a corner, making it hard to arrange the seating areas. It looks like you are have created a couple of seating areas to accommodate the shape and design of the room. The fireplace wants to be the focal point. If you really want the wall to be the focus, then maybe there is room for some type of attactive divider to separate the seating area by the fireplace from the rest of the room? I think I’d rearrange the furnitue first and work on the overall bones of the room. Othewise, I think the accent wall will still fight with the fireplace no matte what color it is.I’ve seen other rooms where the layout and shape of the room plus the placement of the fireplace present real challenges. This might be the perfect place to try a metallic paint for a little pizazz. Maybe a champagne or bronze. I like the coral best; it certainly would make that room pop! Thanks for including the mini art lesson. I am usually pretty good working with colors intuitively, but It helps to have someone spell out why something works. I vote for Chartreuse from the Sherwin Williams Suburban Modern line. It is similar to one of the accent colors in her barkcloth and will be in the same color family as the couch. I have a wall in my house painted Chartreuse and it is a fantastic color. A little bit yellow but brighter than the yellow she has now and a little bit green. Yes! Pink would work, but I could never relax in a room with that much pink space. I was trying hard to come up with something else that would work with all the existing colors and couldn’t do it, but I like a chartreuse! It might have to be greyed down in tone to match the other more sedate colors in the room, but it would definitely bring life! 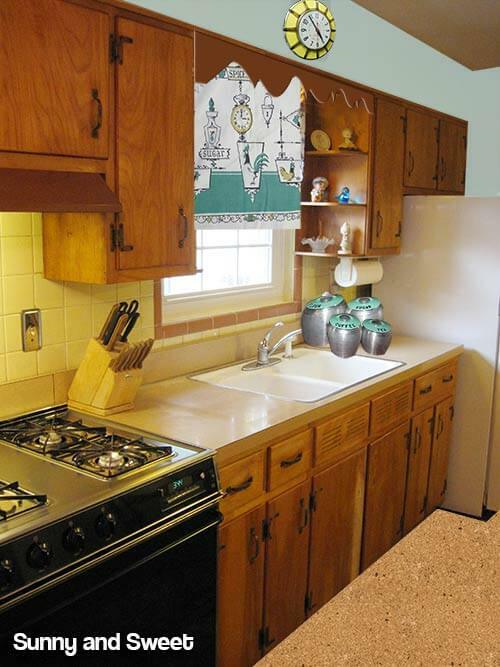 Personally I’d pick an a nice 50s aqua and change the other paint and the couch. Or maybe a pale orange (again, other changes would need to be made). I tried painting part of my basement pink and it was too overwhelming although that might be because of the limited light. I think pink is a really difficult color to find a good shade so if I was to do it again I think I’d buy five or six testers first to make sure I was getting the exact shade I want. Worth trying the Sherwin-Williams Suburban Modern Appleblossom — Karen, you, too, if you want to try this color: It has some blue in it, which cools it off. Kate, do you approve? Am I saying this right? I think pink can be calming but , like yellow, some people can’t handle it for a long time. Years ago they painted “calming rooms” in prisons bright pink and it turned out it only worked for about an hour. Hey, I *think* that I *understand* the furniture placement: You need to watch TV! Directly from on the couch and a bit sideways from one of the side chairs. Makes sense to me. I was just watching HGTV last night (property brothers) and was so annoyed that yet again a TV show put a big flat screen TV in a ridiculous, uncomfortably unviewable place! I am guessing this is Karen’s logic and it make total sense to me. Idea: Watch for an L-shaped vintage sectional — works well in these situations, she could then get part of the sectional against the accent wall and anchor it better, while still being in a cater-corner (sp) position to watch the TV.